The ulcers in my mouth have become painful affairs and too often nowadays I have been waking up starving. I was surprised that after my caloric overload yesterday that today was by far the worst hunger pangs I've felt. Perhaps it has been an accumulation from the past few months, but yesterday was the first time I felt dizzy every time I got up from a chair or from squatting down. From now, I'm planning to make sure that I hit at least 1000 calories a day no matter how much time it takes me. 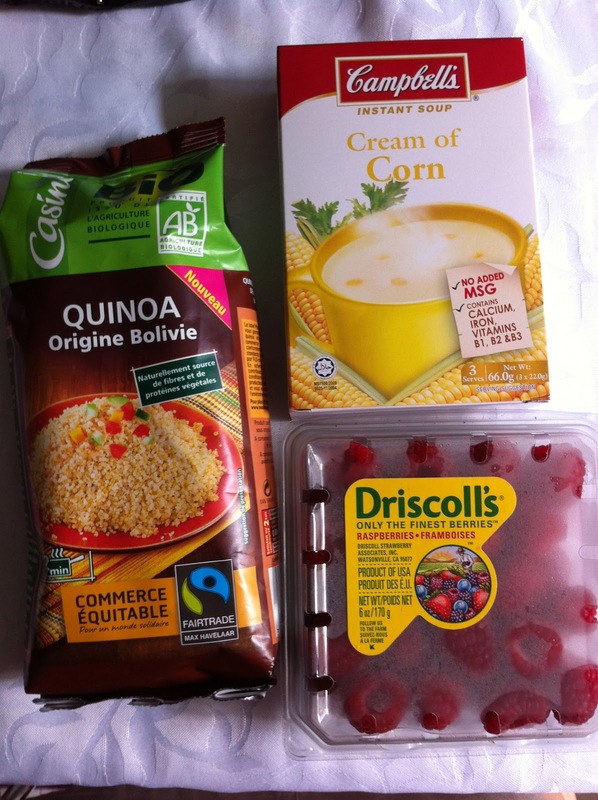 I went out for some more groceries today and got myself some soup, raspberries (for the antioxidants :)) and quinoa (which I have yet to research on cooking ideas for.). 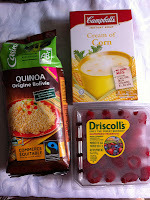 I might just cook the quinoa with cheese to make it a little like a Mac&Cheese dish... but we'll see. I still have a ton of instant porridges - one of which I plan to eat for breakfast tomorrow. Other than that, the dental wax has really helped in keeping the nagging ulcers under control. I've also developed the habit of soaking my teeth in Listerine after I brush. No, I've never had that habit... and even if I had ever tried, I don't think I would ever have voluntarily made it one. Listerine tastes SO nasty! I don't know how people can do it everyday! But I'm doing it to keep the braces clean... I think I'd hate more to get cavities or tooth erosion of some sort. The Listerine really make the ulcers sting though, but I guess that's what antiseptic naturally does. I can't believe it's already 2013. In 9 days I'm going to go through a minor surgery on my face to finally do something that I've wanted to in a long time. No, it's not a nose job, and I already have double eyelids so I'm not getting that done either. I'm finally going to go remove two little moles on my face that have been bothering me forever. 2013 is evidently a year of change and I plan to make it the best year of wonderful liberating changes yet! It will be a year I will just take the plunge into all these decisions that I've put aside out of fear of some sort. It will be a year where I finally find the courage in me to face them point blank, regardless of what others might say or think (of course without crossing the boundaries of my values and good morals). I'm just going to do things for me. It's a public holiday today, and I've decided to stay home, watch a couple of movies, and later take some time to set some more solid goals and plans for the year ahead. Already I'm on my way to some - including braces and planning for jaw surgery, removing the moles, getting back to my happy weight, and running a full marathon this year. This will be a good year.